Cote Saint-Luc City Council adopted a resolution to support the legal challenge of the electoral divisions of Québec seeking that the electoral map maintain the current divisions of Mount-Royal, Outremont and D’Arcy McGee ridings. On March 2, 2017, the Quebec Electoral Commission published the final version of the electoral map which substantially altered the boundaries of the electoral riding of D’Arcy-McGee and seriously undermines public confidence in the objectivity and independence of the Commission. The electoral riding of D’Arcy-McGee will have around 56,000 voters, making it one of the most populous constituencies in Quebec and will, therefore, seriously dilute the political weight of the residents of the City of Côte Saint-Luc. The Commission also decided to merge the electoral divisions of Mount Royal and Outremont. All of these changes will result in the loss of an electoral riding on the Island of Montréal and dilute the political weight of all the residents living on the Island. Other affected municipalities such as the Town of Mount Royal and the Town of Hampstead have already agreed to financially contribute to a legal contestation being filed by Me Julius Grey. 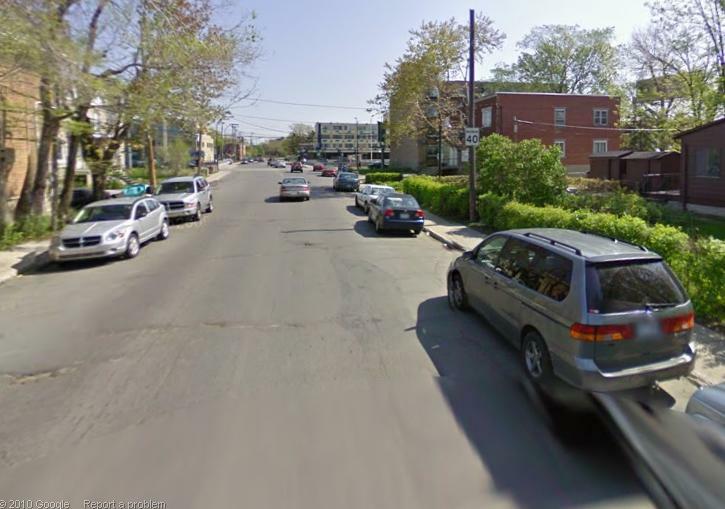 It is in the interest of the residents of the City of Côte Saint-Luc to oppose the decision and to financially contribute to its legal contestation. Therefore the City agreed to support the legal challenge and authorized an expenditure of $7,000 to this challenge. 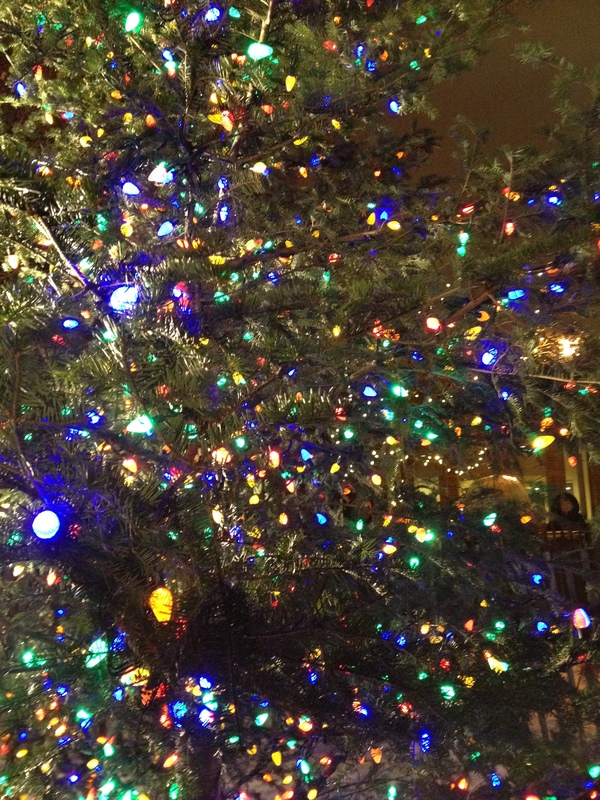 Additionally, the City will match up to $3,000 from contributions of its residents. Residents interested in supporting the challenge can make their cheques payable to Julius Grey, In Trust, and drop off or mail to the City of Cote Saint-Luc, 5801 Cavendish Blvd., CSL, QC H4W 2C2. Elimination of Mount Royal perversely penalizes communities, A letter by Anthony Housefather, M.P. 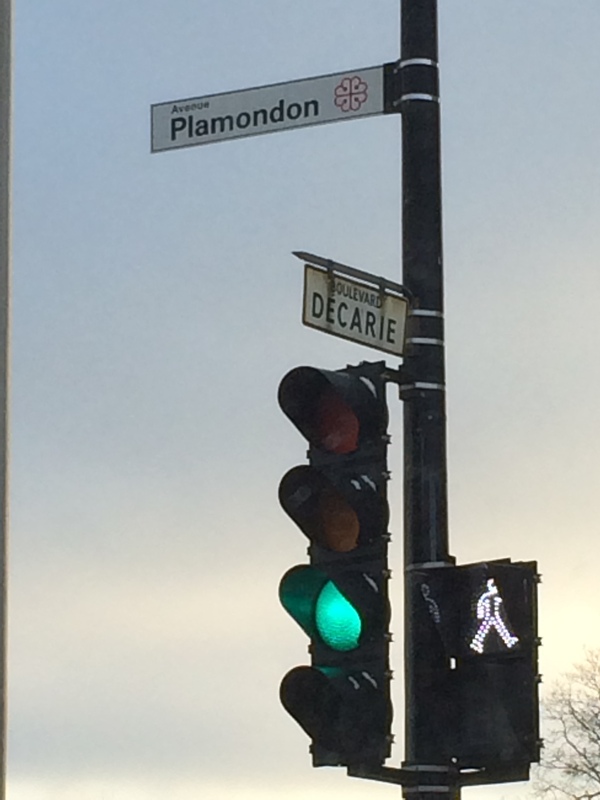 Wishful thinking: Green light at Plamondon and Decarie. 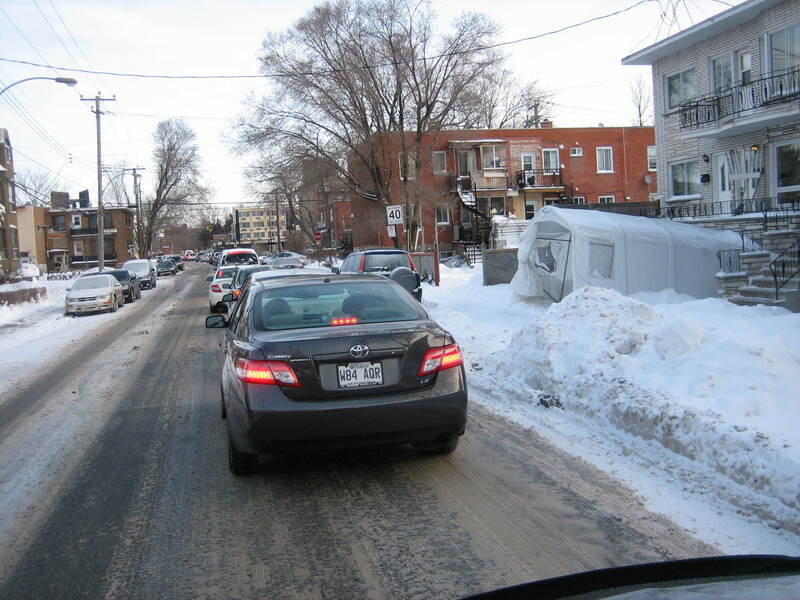 Despite assurances I received from the previous administration in the Borough of Cote des Neiges – NDG to my suggestion for minimal restrictions on morning rush hour parking on the block of Plamondon, just west of Decarie, as well as on Vezina, nothing has been done over the last three years. Traffic congestion continues to worsen year after year. By eliminating the very few parking spots on these two blocks, two lanes of traffic will be able to queue at the red light at Decarie, therefore doubling the capacity of these intersections during the morning rush hour congestion. On Plamondon, there is just one single house on the block westbound from Coolbrook as one approaches Decarie. Traffic here routinely backs all the way toward Ferncroft in Hampstead, as seen below during a typical morning rush hour in December. 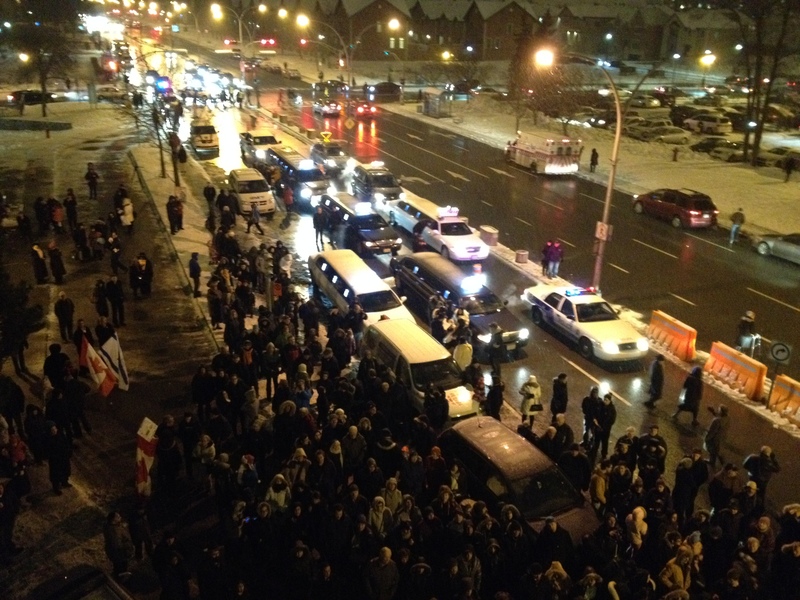 These vehicles are generally coming from Cote Saint-Luc and Hampstead, but also from the Snowdon area. …and the view from behind is not much better. Borough Mayor Russell Copeman is open to the idea. I ask Snowdon Councillor Marvin Rotrand to be open-minded to dealing with his neighbours in CSL and Hampstead in trying to improve circulation throughout the area. Surely it is not to the advantage of his constituents to have constant idling of cars and buses that are blocked from crossing Decarie each morning. 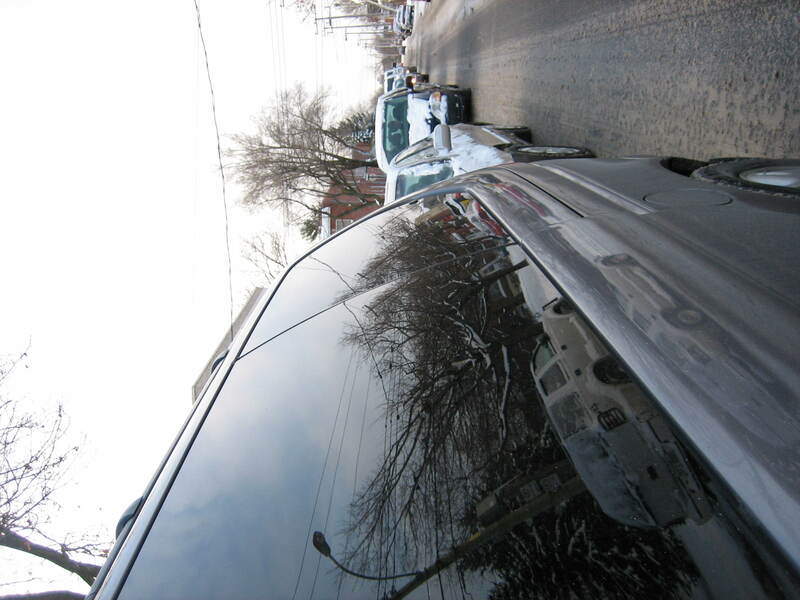 The reduction of very few parking spaces on Plamondon, and on Vezina, would increase traffic flow and decrease noise, pollution and frustration. 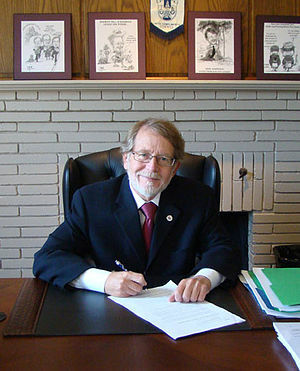 Mayor Bill Steinberg and the members of Hampstead Town Council have taken a principled and bold stand against the odious proposed “Charter of shame” (as coined by MP Irwin Cotler), the PQ government’s Bill 60. 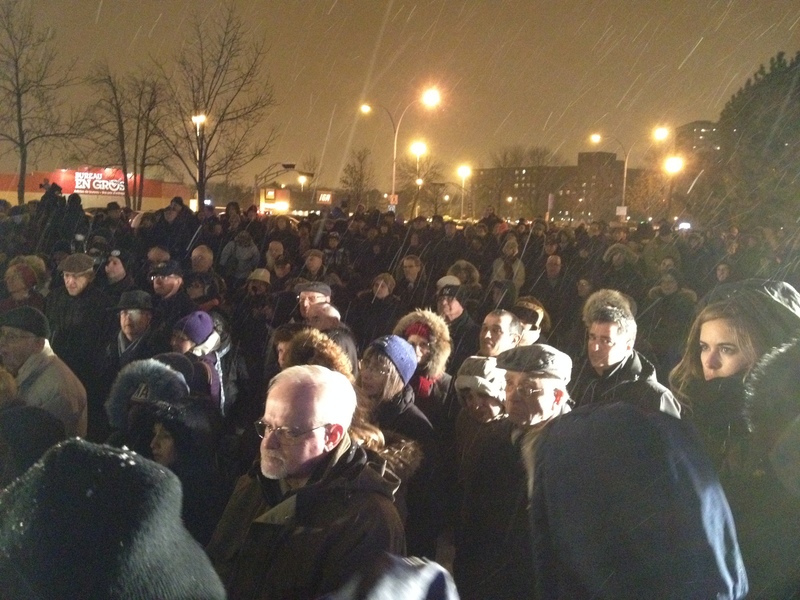 Mayor Steinberg announced at Monday night’s rally outside Cote Saint-Luc City Hall that his town was poised to adopt a resolution later that night denouncing the bill as “racist and immoral”. This strong language stands in sharp contrast to that of Cote Saint-Luc’s resolution against the Charter of Quebec Values adopted in October. We believe in a Liberal Democracy the majority does not have the right to pass racist and discriminatory laws against any minority. The strength of a society is not evidenced by its ability to subjugate its minorities but by its ability to protect them. Should this Charter, or any variation which violates the Quebec Charter of Human Rights and Freedoms or the Canadian Charter of Rights and Freedoms. be passed by the National Assembly, the Town of Hampstead will not recognize it as a valid law. We will not comply. 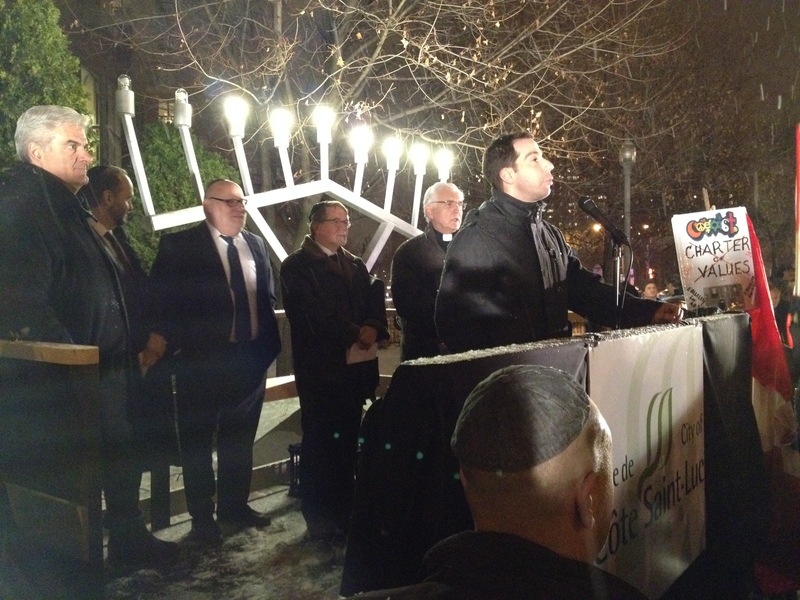 We will not be complicit with hatred, racism and intolerance. Mayor Steinberg and the council have shown solid leadership in taking this position and standing up against the Quebec government and their horrendous, discriminatory law. Indeed, every municipality on the Island of Montreal, including the City of Montreal, has spoken out, either individually or through the Association of Suburban Municipalities against the so-called Charter of Quebec Values. 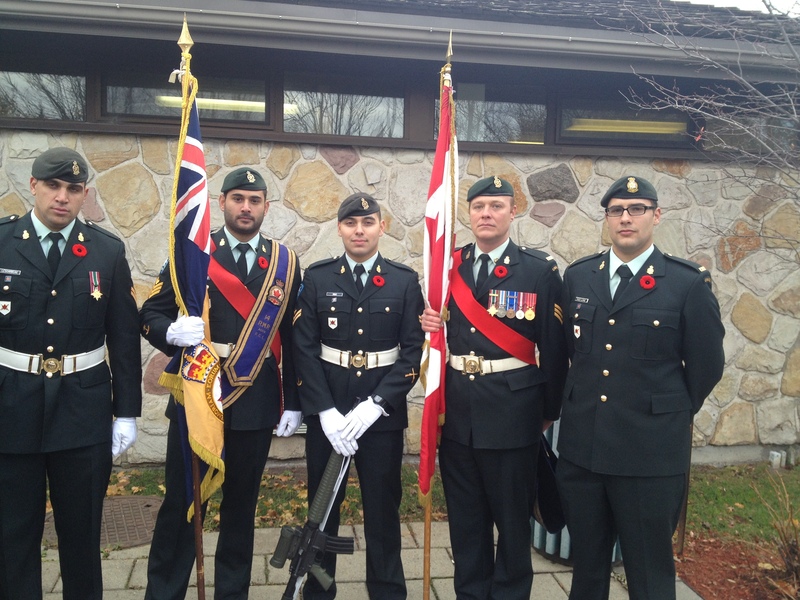 Bright skies and a cold breeze greeted more than one hundred and fifty people who assembled at the Town of Hampstead cenotaph for the 2013 Remembrance Day ceremonies Thursday, November 7 at noon. 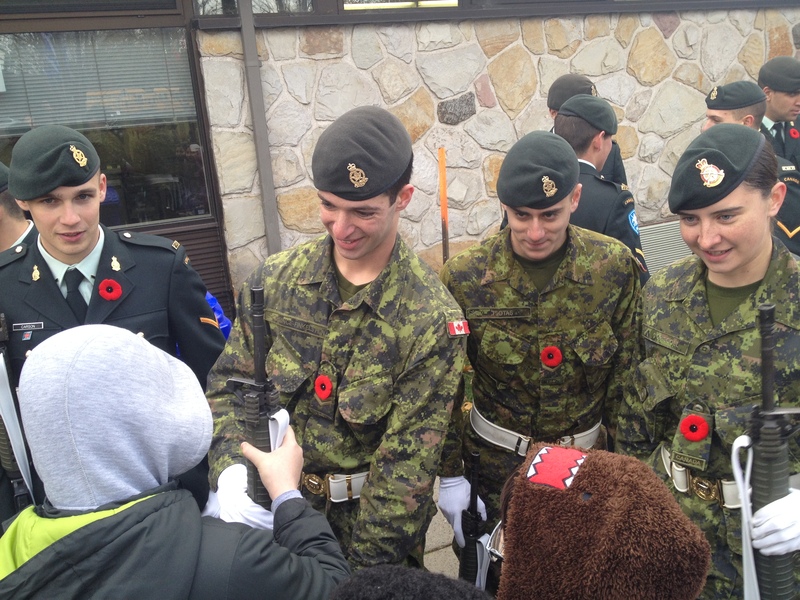 Public Security Lieutenant Mike Fitzpatrick blasted commands in true military style as the soldiers of the Royal Montreal Regiment Branch 14 and members of the Royal Canadian Legion assembled their colours before a large audience of school children from Hampstead School, Solomon Schecter Academy, JPPS and Bialik High School. 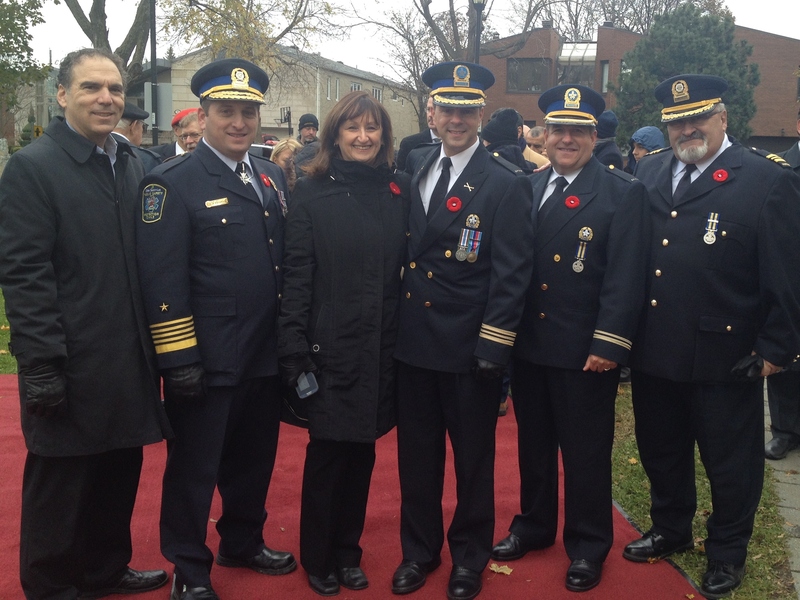 Mayor Bill Steinberg welcomed members of his council as well as Councillor Ruth Kovac and myself who were representing the City of Cote Saint-Luc along with Public Safety Director Jordy Reichson. Also in attendance were Station 9 Police Commander Marc Cournoyer and his Lieutenant J.P. Theoret, Mount Royal riding Chief of Staff Howard Liebman, Montreal Torah Centre’s Rabbi Moshe New, Adath Israel’s Rabbi Michael Whitman as well as holocaust survivors and other dignitaries including former Councillor Bonnie Feigenbaum and Isadore Goldberg. One by one the various school classes were called up to the microphone to recite poems and sing songs of remembrance in honouring those who had fallen to protect Canada and the world, those who were injured in the line of duty, those who serve today in peacekeeping roles around the world as well as to those who perished in the Holocaust at the hands of the nazis. 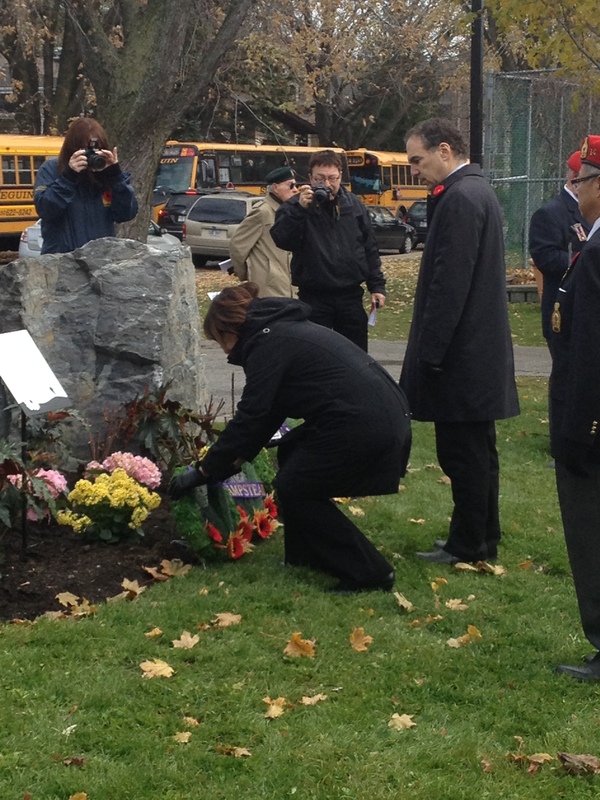 On this 11th hour of the 11th day of the 11th month, we pause in tribute and we remember. We reflect on all of those who fought in the First World War, the Second World War, the Korean War, and those who participated in peacekeeping missions around the world. 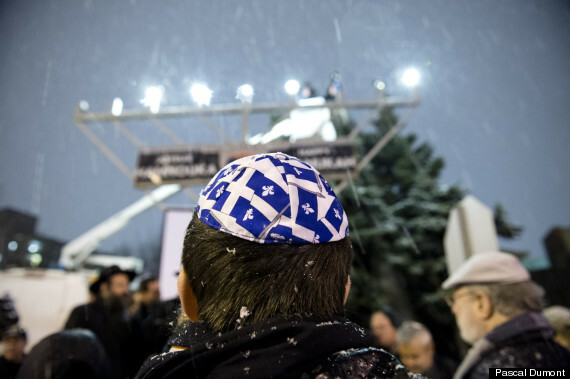 We remember as well those murdered by the Nazis in the Shoah, and pay tribute to the survivors. This is also a time to reflect on those currently serving our country abroad including those selfless individuals who are involved in peace operations to help bring about security and stability around the world. This year also marks the 75th anniversary of the infamous Evian Conference, the 75th anniversary of Kristalnacht (the Night of Broken Glass) and the 65th anniversary of the Genocide Convention (the Never Again Convention) and of the Universal Declaration of Human Rights. 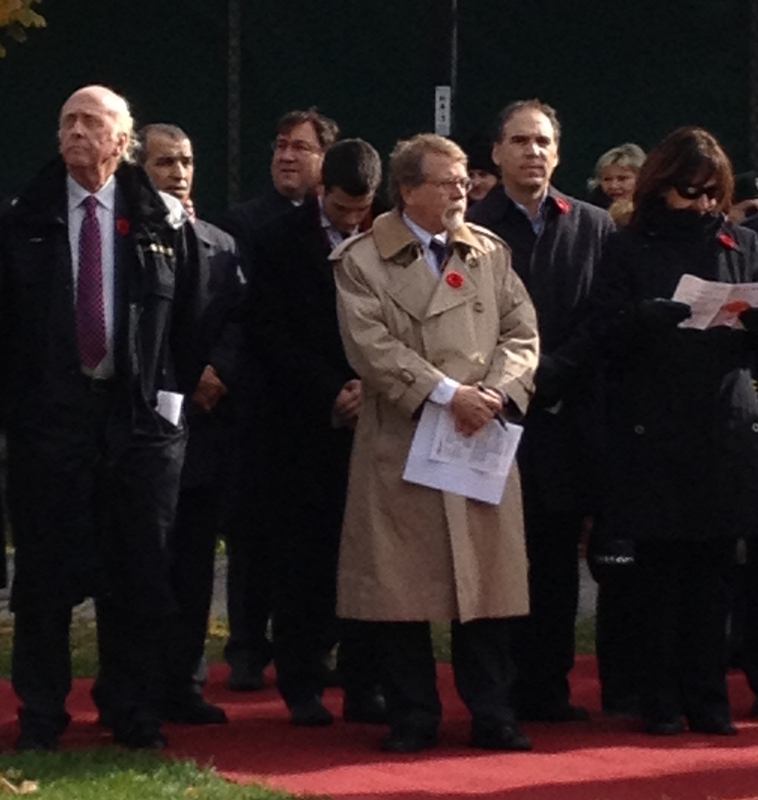 At this moment of Remembrance and Reminder – of Witness and Warning – our Member of Parliament, Irwin Cotler, reminds us that Canada’s veterans have fought dutifully and courageously for their country and the preservation of peace, security, and human rights abroad. We can all take pride in their service. We Remember. Nous nous souvenons.